ēkaślōki Rāmāyaṇa (एकश्लोकि रामायण) | Śrīmad Rāmayana in just one Shloka! ēkaślōki Rāmāyaṇa (एकश्लोकि रामायण) : Śrīmad Rāmāyaṇa in just one Shloka! ēkaślōki Rāmāyaṇa (एकश्लोकि रामायण) means Śrīmad Rāmayana in just one Shloka. There are many scriptures which have Ek-Shloki Rāmāyana! Translation: When Shri-Rambhadra (भद्रो) along with Sita (भद्रया) came to the forest (स्वसारं) named Dandakaranya, then lustful Ravana (जारो) in disguise came to abduct Sita, however (at that time) Sita was with Agni-Deva (and Ravana abducted Maya-Sita). When Ravana was killed, then Agni-dev along with Maa Sita who is adorned with auspicious marks and refulgent with own splendours appeared in front of Lord Sri Ram (राममस्थात्). Translation:Who has complexion and softness like that of a blue lotus, whose body parts are very soft; On whose left side resides his dear consort Sita; Who has a divine arrow and a beautiful bow in His hands, I pray to that Shri Rama who is the Lord of Raghu dynasty. Neelāmbuja Shyāmal Komalāngam : The blue lotus like soft body parts are of child Rama, thus it is the description of the Baal-Leela of Lord Rama. 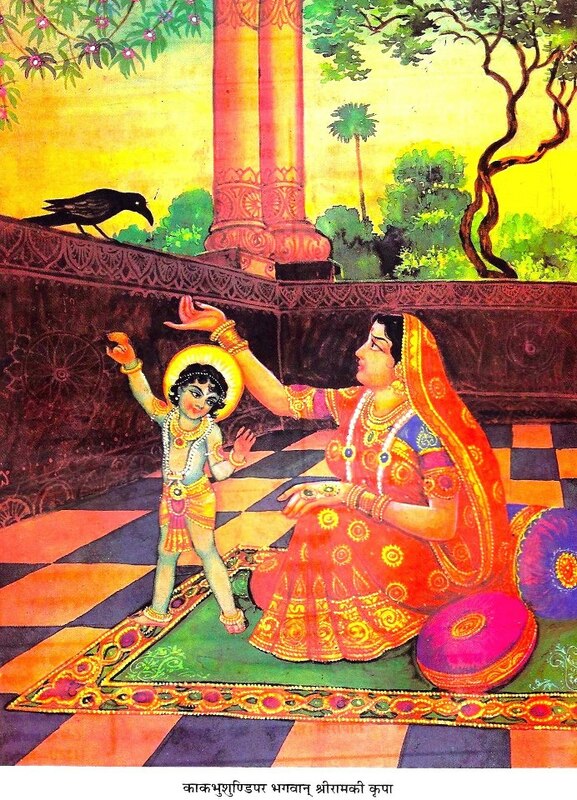 Sītā Samāropita vāma Bhāgam : By sages and saints, Sita was given seat on the left Side of Lord Sri Rama during their marriage, it is the description of the Vivah-Leela of Lord Rama. Pānau Mahāsāyak Chāru chāpam : By taking arrows and beautiful bow in hands, Lord Rama slayed all the evil demons, It is the description of exploits of Lord Sri Rama in war i.e. Ran Leela. Namāmi Rāmam Raghuvansh Nātham : After killing Ravana, the coronation of Lord Sri Rama was done on the throne of Ayodhya, then Lord Shiva, Lord Brahma and all deities made salutations in the lotus feet of Lord Sri Rama. Thus it is the description of Lord Rama's Rajya-Leela. It unveils how Lord Rama becomes the delight of all the worlds. Whole world became the world of Lord Sri Rama. Translation : For the sake of [keeping the promise of] His father, Lord Śrī Rāma immediately gave up the position of king and, accompanied by His wife, mother Sītā, wandered from one forest to another on His lotus feet, which were so delicate that they were unable to bear even the touch of Sītā's palms. The Lord was also accompanied by Hanumān [or by another monkey, Sugrīva], king of the monkeys, and by His own younger brother Lord Lakṣmaṇa, both of whom gave Him relief from the fatigue of wandering in the forest. Having cut off the nose and ears of Śūrpaṇakhā, thus disfiguring her, the Lord was separated from mother Sītā. He therefore became angry, moving His eyebrows and thus frightening the ocean, who then allowed the Lord to construct a bridge to cross the ocean. Subsequently, the Lord entered the kingdom of Rāvaṇa to kill him and other wicked demons, like a fire devouring a forest. May that Supreme Lord, Śrī Rāma give us all protection. Sage Śukadeva Goswami is Ananya-Śrī Rāmopasaka Vaishnava, Here he prays to Śrī Rāma for his protection (and also for the protection of Parikshit Maharaja). Translation: The extremely amazing and valorous exploits of Lord Sri Rama are spread across the millions of scriptures (ग्रन्थकोटिभिः). Sage Shukadev is going to describe that infinite glory of Lord Sri Rama in just 2 chapters and He summarizes the same in this single shloka ( ek-shloki Ramayana). Here Sridharacharya refers about Shatkoti Ramayana. There are various reasons behind Shukadeva beseeching for the protection from Shri Rama, and thus surrendering to him in the very beginning. Shri Ram is renowned for giving protection and ensuring "Abhayam" (i.e. 'Mukti' and complete fearlessness from terrible fear of birth and death) to those who surrender to him, so Shukadev prays to Ishta Sri Rama for his own protection as well as protection for Maharaj Parkishit who is going to die in next few days. Another reason is - Shukadev Goswami wants to summarize that infinite glory of Sri Rama which is spread across millions of scriptures, He wants to build a bridge across the ocean in form of Sri Rama's Charitam, therefore who can be a better help other than Shri Ram himself? So he surrenders to Shri Rama in beginning itself and ask his protection before summarizing Shrimad Ramayana. The content on website is written purely for the spiritual purpose of spreading love and devotion in the lotus feet of Bhagavan Sri Sri SitaRam by SiyaRaghavendra Sharan. Website is developed and maintained by SiyaRaghavendra Sharan.